Aimtell's built in conversion tracking allows you to easily see how your push notification campaigns are performing. Aimtell's built in conversion tracking allows you to easily see how your push notification campaigns are performing beyond the traditional "sent" and "clicked" measurements. With conversion tracking, you specify a custom event that will serve as the conversion/goal. Conversions are based off custom events. For Shopify users, we automatically track several events for you. First off, head to your dashboard and click 'Manual Notifications.' 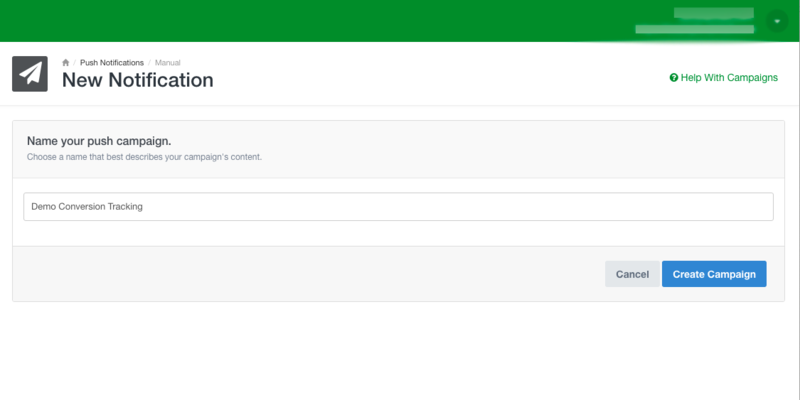 You can set up conversion tracking for any new manual campaign that you create. Notice at the top a tab labeled 'Conversions.' Clicking here will allow you to turn on conversion tracking for this campaign. You have the option to turn it on or leave it off. Clicking to turn it on will track your conversions based on the event that you determine. Note: Make sure to click 'On' in order to activate Conversion Tracking. With conversion tracking turned on, you must fill in the boxes for your 'Event Category' and 'Event Action'. You have the ability to set any custom event to define the conversion. Note: Category and Action are required, all other event fields are optional. Also, you must first track this event before it is made available on this page. You can refer to this article for tracking custom events. A popular example is for items purchased. For Shopify users, we automatically track this event for you so it's a great way to get set up instantly. If you decide a user purchasing any item counts as a conversion, you would set your Event Category as: Item and your Event Action as: Purchased. As you type these in, the boxes should help autofill for you. When you are satisfied with your campaign and the conversion tracking you have set up, click 'Schedule Push.' Once the campaign has been sent, you can begin to track the conversion results. Heading back to your list of manual campaigns, you are able to see how many conversions there are for a given campaign by looking in the 'Conversions' column (far right column). For a more detailed view, click 'View Results' next to any campaign. From that screen, click the 'Conversions' tab to see your conversions. Here you will see a list of all of your conversions for the campaign you selected. The number of total conversions is also conveniently displayed at the top along with stats on how many notifications were sent and how many were clicked.